Your web host is one of the building blocks of your blog; that is if you are serious about growing it. In all likelihood, you’ve had more than one annoying experience of visiting websites that take forever to load a single page or are always down. More often than not, this is due to poor web host – or web hosting plan. One mistake that bloggers make is to stay with a free web host even as their blog grows. This is a case of false savings, as outlined in a previous article of ours, Free or Paid Hosting? Why Paid Is (Almost) Always the Better Option. It is, however, somehow understandable to go for free hosting when your blog is not bringing in enough money yet. If you’re in this boat, then you’ll be happy to know we’re going to treat you to a free hosting plan giveaway, courtesy of Squidix. Squidix is an IT consulting firm focusing mainly on web hosting and development. They started five years ago and have now established its name in the IT industry. Whether you’ve heard about Squidix or not, we’re sure you’ll want a (free) taste of what they have to offer. The firm has several hosting options, including Shared Hosting, Semi-dedicated Hosting, Dedicated Server Hosting, Storage Hosting, and more. More so, what’s included in the service is the same value all their customers enjoy. Hosting, 24/7 support, knowledgeable staff, and bleeding edge hosted environments. They utilize the resources of the QuadraNet Dallas data center, a facility with 80Gbps connectivity and uncompromised security practices. At the end of the 12-month term, you may choose to renew at any rates offered on the site at that time. There are no obligations. 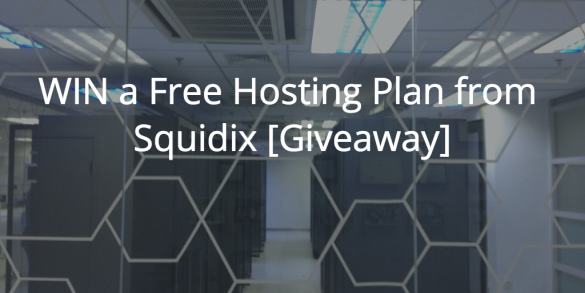 Learn more about Squidix’s Shared Hosting Plan. We’re giving away FIVE hosting plans as detailed above. Get in on the action by sending in entries using the Rafflecopter widget below. With just a few clicks, you can have a free hosting plan for one whole year. It starts today, January 11. It ends on Sunday, January 17. Winners will be announced on Monday, January 18. You can tweet every day to earn more entries and increase your chances of winning. For me, it needs to be easy to setup and use. Awesome giveaway and very useful to start a new website. It’s goind to help me for my new project a lot.